"I'm convinced that our success will grow"
The meeting took place on 6 September at the initiative of Günther H. Oettinger, European Commissioner in charge of Energy and representative of the European Atomic Energy Community. 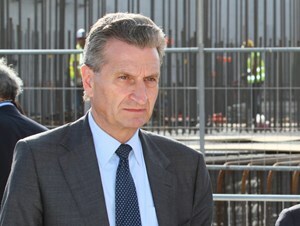 When he came to ITER on 17 January 2013, European Commissioner for Energy Günther H. Oettinger took a solitary stroll into the Tokamak Pit, away from officials and the media, touching the smooth concrete of the seismic plinths as if to assess the reality of the project and the "impressive amount of work" that had already gone into ITER construction. Last Friday, 6 September, the plinths and seismic pads were no longer visible. Formwork and rebar for the B2 slab—the actual floor of the Tokamak Complex—hid them from view and made strolling impossible. As one newspaper article pointed out the following day, "the ITER Tokamak Pit now looks like a conventional worksite." As Commissioner Oettinger stood with other invited guests at the edge of the Seismic Pit, however, the view was striking: the large circular rebar at the centre of the Pit where the 23,000-tonne machine will sit; the towering walls; the forest of rebar that is going up on either side for the Tritium and Diagnostic buildings. "This is a historical undertaking," said the Commissioner, addressing the media. "Our visit here is sending a clear, positive message to all those working for ITER." The Commissioner stressed the progress that has been made to date, adding, "Our project is now well into the construction phase. I'm convinced that our success will grow..."
It was the Commissioner's second visit to ITER this year: in January 2013, he was an invited guest for the inauguration of ITER Headquarters. 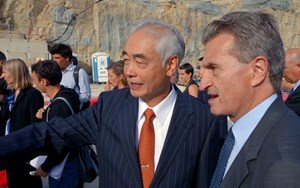 During the ITER Council Ministerial-Level Meeting that took place minutes later in the Council Chamber on the fifth floor of Headquarters, the Commissioner sought to "personally thank ITER Director-General Osamu Motojima and his staff for the remarkable work that we were able to witness on our tour of the site." The Commissioner also mentioned the "many positive developments for which the ITER Organization and the ITER Members should be commended." 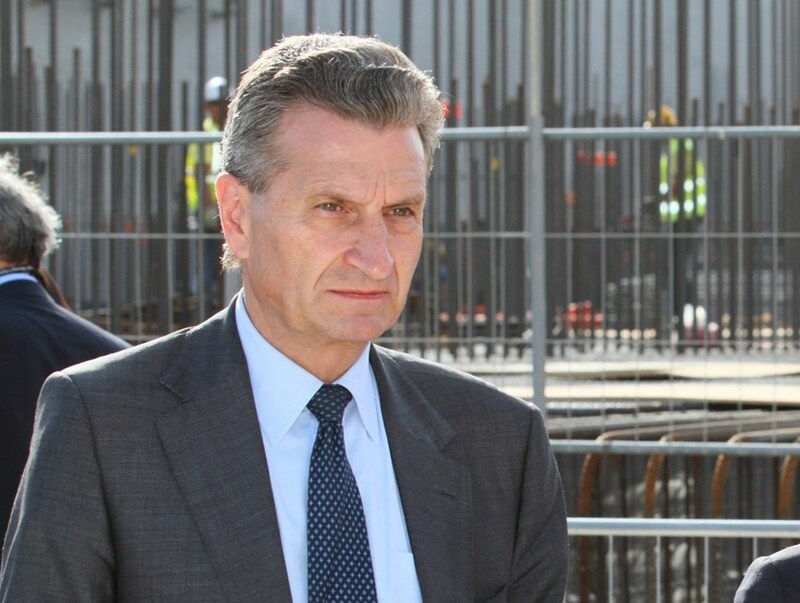 At the press conference that followed the meeting, Commissioner Oettinger insisted once again on the historical, one-of-a-kind nature of the project, adding that he, as well as all the ITER Members, acknowledged the inherent challenges, notably as regards schedule and cost containment.